In recent years, a new class of designer drugs has appeared on the drugs of abuse market in many countries, namely, the so-called beta-keto (bk) designer drugs such as mephedrone (bk-4-methylmethamphetamine), butylone (bk-MBDB), and methylone (bk-MDMA). 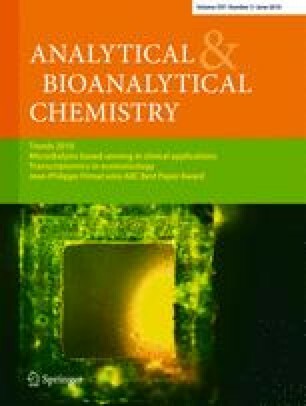 The aim of the present study was to identify the metabolites of mephedrone in rat and human urine using GC-MS techniques and to include mephedrone, butylone, and methylone within the authors’ systematic toxicological analysis (STA) procedure. Six phase I metabolites of mephedrone were detected in rat urine and seven in human urine suggesting the following metabolic steps: N-demethylation to the primary amine, reduction of the keto moiety to the respective alcohol, and oxidation of the tolyl moiety to the corresponding alcohols and carboxylic acid. The STA procedure allowed the detection of mephedrone, butylone, methylone, and their metabolites in urine of rats treated with doses corresponding to those reported for abuse of amphetamines. Besides macro-based data evaluation, an automated evaluation using the automated mass spectral deconvolution and identification system was performed. Mephedrone and butylone could be detected also in human urine samples submitted for drug testing. Assuming similar kinetics in humans, the described STA procedure should be suitable for proof of an intake of the bk-designer drugs in human urine. The authors thank Armin A. Weber and Gabi Ulrich for their support.